It seems like the higher gas prices go, the more efforts we exert to try and find ways to save money on it. We have to, unless we have infinite supply of money or our cars run on some futuristic solar energy source. There are lots and lots of websites out there, offering different tips on how to save gas and make your car more fuel-efficient. You know them, ‘drive slower’, ‘don’t idle’, ‘use the AC sparingly’ and so on. But I am sure we have heard all of these and most of us are applying them. But is there anything else we can do to maximize our fuel savings and efficiency ever more? 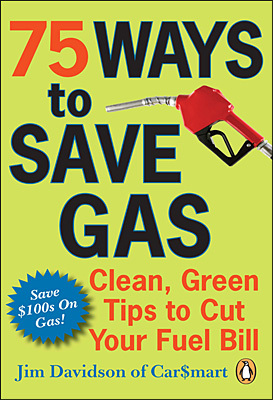 Jim Davidson, a Canadian author, offers 75 tips and explains each one of them and how it can save you money on fuel. For example, we often hear that to save gas, you have to drive slower. But what it the reasoning behind it? Jim goes into details explaining this and the ideal speed at which to drive and which speeds at which-and beyond-do you waste the most gas. The more we know about how applying a specific tip helps save on gas, the easier it becomes to apply it and get the intended objective from it. For each tip presented, the author gives a percentage of how much you will save from applying that method. For example, one of the tips offered is to use ‘synthetic (factory-made) oil.’ By doing this, you can save up to 10% on gas. It is interesting that one of the tips presented is to ‘sell your car for a more fuel efficient one’ which we have written about here on Budget Sense recently. Not everyone of the 75 tips may make sense or sound appealing to everyone. You may disagree with some of them, and by all means, you don’t have to apply all of them. But I can almost guarantee that if you read every tip in this book and apply the ones that make sense-or at least experiment with them-you will end up saving on gas. These days, with gas hovering around $1.50 per liter in Canada, and some 4 dollars per gallon in the USA, any savings we can get is a good thing for our budgets. -You can buy the book on Amazon.com or at your local book store.